Lubiprostone, available as the brand Amitiza, is a prescription laxative that is helpful for people with chronic idiopathic constipation or irritable bowel syndrome with constipation. Amitiza is classified as a chloride channel activator; it draws extra fluid into the bowel, which helps the stool pass through more easily. Although Amitiza can cause many side effects, it is generally not associated with weight loss. Chronic idiopathic constipation involves a long-term problem with difficult or infrequent passage of stools. The symptoms are not connected with a disease or medication. A standard dose of Amitiza for treating this disorder is 24 mcg twice per day taken with food and water. Doctors also prescribe Amitiza for irritable bowel syndrome with constipation. This condition causes chronic stomach pain or cramps, bloating and infrequent or difficult passage of stools. The standard dosage for this condition is 8 mcg twice per day with food and water. 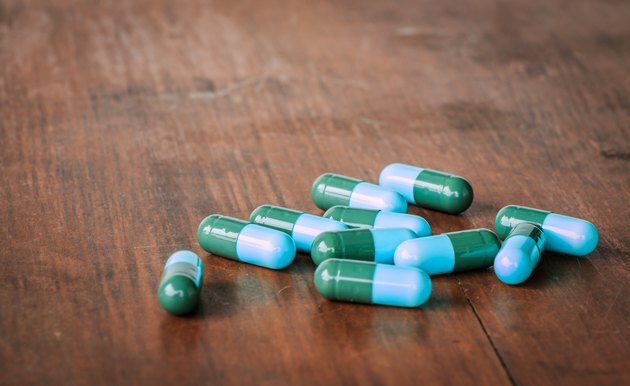 While weight loss is not a reported side effect of Amitiza, some digestive side effects associated with this medicine could lead to weight loss. In premarketing studies with Amitiza, up to 29 percent of participants experienced nausea, according to eMedTV. Taking Amitiza with food may reduce this side effect. Up to 12 percent of participants in these studies experienced diarrhea. Severe diarrhea is possible as an Amitiza side effect; tell your doctor if you develop this problem. Other digestive side effects occurring in smaller percentages of people taking Amitiza include vomiting, heartburn, stomach pain, bloating and gas. Weight loss is a possible side effect of Amitiza in one particular situation -- overdose. Signs of an Amitiza overdose in addition to weight loss may include dry heaves, flushing, sudden or increased sweating, burning or itching sensations, pale skin, lack of strength, unusual tiredness and a slow heartbeat. Signs of an Amitiza overdose call for emergency medical attention. Amitiza is associated with a large number of other side effects. You could experience effects such as a dry mouth, fluid retention, shortness of breath, tightness or discomfort in the chest, weight gain, heart palpitations, headaches, dizziness or fatigue. Tell your doctor if any of these side effects become severe or do not dissipate with time.